The nine tournament participants (Left-Right) Kong Wan, Dave Beveridge, Graham Wood, Sascha Roschy, Ian Smith, Sandy Pearson, John Carlton, Clyde Johnson and Howard Lee. 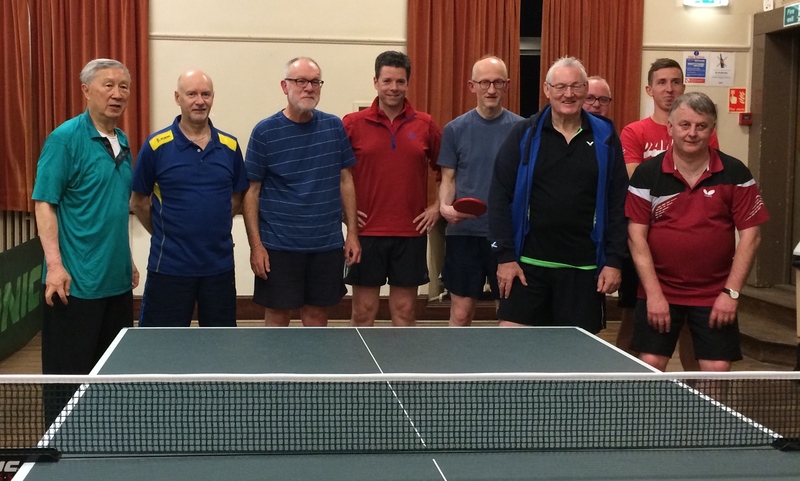 St Andrews’ programme of events celebrating our patron saint gave an excuse for a most enjoyable evening’s table tennis at the Victory Memorial Hall on Friday. Hosted by the local club, play started with an open session to encourage young and old to either give the sport a go for the first time or to dust off a bat after years of neglect. Both these aims were certainly achieved, with the youngest participant having only had six birthdays and the two grandparents who took to the tables not divulging how many birthdays had passed! Those at the extremes of the age range were joined by the ‘in-betweeners’ in a number of fun games over 90 minutes’ play, culminating in the favourite grand finale – ‘running round the table’. At 7.30pm the tone of the evening became much more serious with nine of the league players competing furiously but fairly in over two hours of tournament play. With players starting out in three groups of three, there were some unexpected results. Most notably, Sandy Pearson posted a 3-1 victory against Ian Smith. Condolences to John Carlton who drew the two ‘funny bat’ players in his group. As ever, John rolled up his sleeves and will have gained more experience to take back to the table tennis club in Crail which is going from strength to strength under his tender care. In this group, Howard Lee scored his first win ‘evah’ over Graham Wood to take his place in the winner’s group alongside Clyde Johnston and newcomer Sascha Roschy who had both scored two victories in their respective first stage matches. With ‘participation’ the name of the game, those placed first, second and thirds from the stage one groups formed three new groups to determine the final placings. The matches in the group playing for 7th to 9th position were contested just as fiercely as in the group to decide the overall winner. However, nowhere was competition tighter than in the group to decide 4th to 6th positions where each player posted one win and one loss, with Dave Beveridge just taking 4th spot by virtue of having the best ratio of sets won to lost. 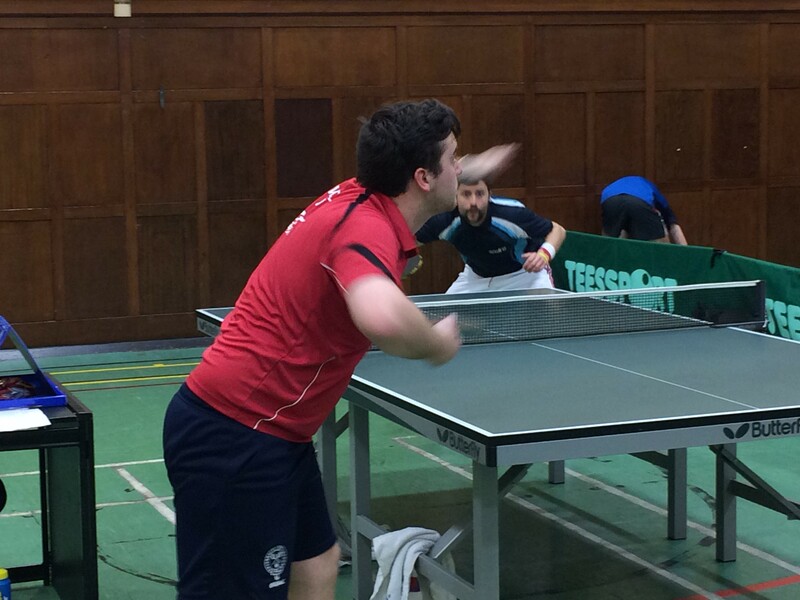 On the top table, Howard started brightly by taking the first set against Clyde. However, last year’s champion fought back to take the next three sets, leaving Howard the daunting task of having to tame Sascha’s powerful attack if he was to stay in the running. Sascha started the better, taking a 2-0 lead, but Howard fought back to take the third; and the fourth was nip and tuck with Sascha running out the winner with a 12-10 scoreline. With both Clyde and Sascha committed to attacking play, a mouthwatering final match was in prospect and it didn’t disappoint. Sascha went into a 1-0 lead which Clyde pegged back, winning at deuce. Sascha took the lead again with some blistering attack but Clyde was not giving up his title lightly and matched Sascha all the way to 10 all in the 4th game. However, the next two points went Sascha’s way and so a new name goes on the roll of honour with club chairman Neil Lea presenting the winner’s medal to Sascha. And we’re all looking forward to St Andrews Day 2017 already! This entry was posted in St Andrews Table Tennis Club on November 30, 2016 by standrewstt. The Victory Memorial Hall is the place to be this Friday evening (November 25th) for any budding, or past, players to ‘give table tennis a go’. From 6.00pm to 7.15pm, all ages and standards will be welcome to take part in a very informal session as part of the local club’s involvement in the St Andrews Week celebrations. From 7.30pm the evening takes on a slightly more serious tone with the four tables being devoted to tournament play with Clyde Johnson attempting to defend the title he won last year in an entertaining final against Howard Lee. It’s also a busy weekend on the road for three club players. Michael Hahn is travelling to Nottingham to compete in the British Universities Championships, while Keir Paterson and Campbell Snodgrass make the shorter journey to Bathgate Academy which is the venue for the Scottish Primary Schools tournament. The past week saw the second derby match of the season with Truants and New Kids clashing in a Division Two fixture. Four close five setters showed the level of determination of both sides. New Kids had the better of the first two, with Ken Falconer edging out Alain Leger 18-16 in a marathon final set and Ian Smith victorious in a long tussle with Knut Radmer. With the match score at 3-3, the doubles took on great importance. Sascha Roschy and Alain came back from 1-2 down to win in 5 and give Truants a slight advantage. Ian levelled the match score but then Knut put Truants into an unbeatable position with a 5-set win against Kong Wan and Sascha followed this up with his third straight sets singles win to inflict a 6-4 defeat on New Kids. In Division Three, Prospects were also involved in a close tie at home against Broughty side, Villa. Sandy Pearson set them on their way, holding his nerve in a 15-13 fifth game win against Jim Fleming. This set the pattern for an evening which saw only one straight sets win, six four setters and three five set matches. Emily Howat followed Sandy’s example in digging in to beat Daniel Russell, coming back from 1-2 down to win the fourth 14-12 and the fifth 11-9. Fabio Sani chipped in two wins and Sandy added another for a good team effort to achieve a 5-5 draw. Prefects faced top class opposition at Ward Road Gym on Tuesday when they took on current leaders, Knights. Michael Hahn got them off to a good start with a win against Callum Riddoch, but lost the battle of the no. 1s to Robert Toth in four sets. Michael also enjoyed a tight victory against Stuart Halliday, but neither Clyde nor Howard Lee could find a way past the three Knights to add to Michael’s two points. This entry was posted in Match reports, St Andrews Table Tennis Club on November 19, 2016 by standrewstt. It seems that the teams from St Andrews Table Tennis Club have an agreement at the moment that only one should win each week. This week’s victors were Truants who, playing against strong Mylnefield outfit Chieftains at Ward Road Gym, gave Sasha Roschy his debut. Graham Wood produced his usual reliable performance in winning his three singles and, as team captain, must have been delighted when Sasha matched this and also proved to be a fine doubles player when they combined to add that point as well, giving an overall 7-3 win. It was a frustrating night for reserve Emma Bissett who battled hard but missed out on getting on the scoreboard. On a nearby table, a classic Division Three tie was unfolding between Prospects and Princes who this season are fielding two youngsters under the guidance of Eddie Dougan. The match score swung back and forwards. From taking an early 2-0 lead, the Prospects trio of Neil Lea, Sandy Pearson and Dave Goddard found themselves 2-4 down. A doubles win for Sandy and Dave brought them back to 3-4 and, with the next two singles shared, Sandy took to the table against Jacob Munro in search of the win that would give the St Andrews team a draw. In keeping with the tone of the evening, the match was evenly balanced. Jacob won the first 11-9, lost the second 11-13, won the third 15-13, lost the fourth 8-11. A thrilling decider followed with Sandy finally going down 11-8 to the most promising young player to emerge in Dundee for a number of years. At the Victory Memorial Hall on Monday evening, Prefects were always going to struggle against last season’s Division One winners, Star. Their task was made all the more difficult by the non-availability of both Michael Hahn and Clyde Johnson, and when last minute illness hit Peter Bladen, Howard Lee and reserve Graham Wood faced a mountain to climb. The twosome rolled up their sleeves to make their opponents fight hard but could not avoid a 0-10 whitewash. At the same venue, New Kids faced a similarly tough fixture against top Division Two team Telstars but again put up a strong battle and wins from Kong Wan and Ken Falconer gave them two valuable points in their battle to stay above the relegation zone. A date for the diary for table tennis enthusiasts in the area – on Friday 25th November the club will stage a special evening as part of the town’s St Andrews Week celebrations. Play starts at 6.00pm with an open session for anyone wishing to give table tennis a go and this will be followed by tournament play. This entry was posted in Match reports, St Andrews Table Tennis Club on November 13, 2016 by standrewstt. Time this week to broaden our view of St Andrews Table Tennis Club to take in all its strands, which embrace players from teens to seventies, from beginners to top performers, and all that fall between. On Monday evenings, our Table Tennis Scotland qualified coaches Howard Lee and Dave Beveridge work with a lively group of under 14s at the Victory Memorial Hall. Five of the youngsters have taken on the challenge of playing in the newly formed Dundee Junior League and made their debut at Ward Road Gym on Thursday evening. This exposure to new opponents can only help the development of brothers Campbell and Michael Snodgrass, Edward Coles and Murray and Keir Paterson. At the other end of the age range, the adult beginners/returners group at Kilrymont Community Use is proving so popular that a moratorium is now in place for any newcomers joining the 6.00pm session. However, there is generally still space at the 7.30pm session on Thursday evenings for anyone with past experience in the game to practise alongside current team players. Prefects’ Michael Hahn demonstrates his service action in a recent fixture at Ward Road Gym – the ball has still to come down! And so to this week’s results – and the admission that the foregoing had the purpose of disguising the bad news – that we started the week with four teams in the quarter finals of the Secondary Shield and finished the week with no teams in the semi finals! In fairness, none of the four were favourites to win their ties and honourable mentions go to New Kids and Truants who each took their matches against Rollercoasters and Viscounts respectively to the eighth game before succumbing 3-5. Our regular readership will be pleased to know that following the previous week’s run of defeats by the narrowest of margins, Alain Leger managed to win his inevitable five-setter this week! Saving best to last, this week’s plucky performance award goes to Prefects. For the second week in a row they faced Kings in a cup match. Having lost their Excelsior Cup tie to the Mylnefield side, things didn’t look promising when they went 0-2 down in their Chairman’s Challenge quarter final. Once again a victory from Michael Hahn got the St Andrews’ show on the road. Astute player placement for the two doubles ties by captain Howard Lee made use of Clyde Johnson’s forehand attacking skills and suddenly Prefects were 3-2 up. Needing one more win to take the tie, Michael duly obliged with an excellent win against Ade Fabola which puts his team into the semi final in December. This entry was posted in Match reports, St Andrews Table Tennis Club on November 4, 2016 by standrewstt.